Multi-instrumentalist Mike Walsh has been involved with the likes of Dean Fasano, Mark Thompson-Smith, BON JOVI and ALDO NOVA. In 1998 he and DEPARTURE gave us their self-titled debut. Featured were vocalist Ken Michaels and David Rosenthal (RAINBOW, RED DAWN). The band came across as a mix of SAGA, JOURNEY and TOTO, and a follow-up was soon issued. “Open Your Mind” hit the shops a year after, now with vocalist Dave Baldwin. More pomp put them in the direction of KANSAS and STYX. Third outing, “Corporate Wheel” came in 2001, this time with vocalist Timothy Lewis, which was the subject of raving reviews. Now ten years later the fourth installment arrives, and, as seems customary the vocalist is new. Andi Kravljaca of SILENT CALL has filled that position. Featured on drums is Duey Ribestello (JOE LYNN TURNER), and on bass we have Ryan Walsh. 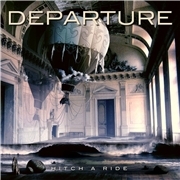 DEPARTURE has created a fine piece of hard rock AOR style, that lacks a bit of spark at times. The music is soothing and very neatly arranged. The craftsmanship is almost immaculate, but it is too neat for my liking in songs like opener “No Where to Go”, the laid-back “You Don´t Need to Do This Anymore”, the KANSAS piece “Fly”, the very middle of the road “Without You”. But when they get everything together, with some spark, they excel in songs like “Soldier of Fortune” and “Travel Through Time”. All in all this is a solid album, but with too few highlights.